It is sweet potato pickin’ season in Mississippi, and because it has been so dry, sweet potato farmers are kicking up huge dust clouds in the fields as they go! If you drive by, it looks like a dust storm! Apparently everyone felt somewhat the same way. They love the traditional casseroles and a hot sweet potato from the oven with sugar and cinnamon and butter. Although sweet potatoes may be part of every Southern Fall food tradition, they are some of the most nutritious vegetables around. Sweet potatoes can be found in local markets year-round, however they are in season in November and December. Just in time for pies and treats for the holidays! And who doesn’t love all of the wonderful products Sweet Potato Sweets of Vardaman! If you haven’t had the experience, stop by the store the next time you are passing through Vardaman. They have sweet potato FUDGE! They have muffins and breads and pies and they are constantly looking for new ways to enjoy the town’s most popular farm product! They also sell marmalades and sweet potato butters – it is endless! There are as many sweet potato pie variations as cooks in the world, possibly. But the one pie I have eaten most often was not made by the original cook. 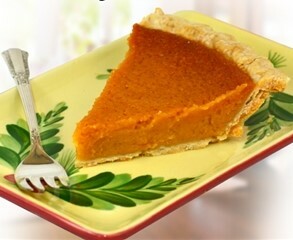 My mother-in-law, Sandra Sisson, makes a basic sweet potato pie from a recipe from the late Thelma Lause. Thelma was her next door neighbor for many years and Sandra can tell quite a few stories about the spirited Thelma Lause. Sandra said this recipe does not have a lot of the spices many people put in their pies, but it has always been a good recipe for her. Cook at 350 degrees until it sets. You just have to watch it. Now, while the rest of the world likes a “sweet” sweet potato, I like a savory one! 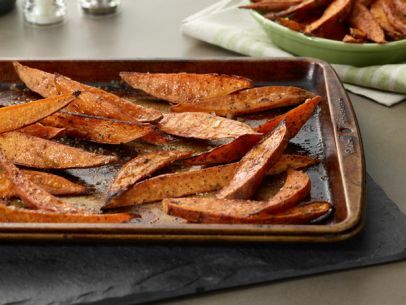 I am not a fan of sweet potato casseroles, necessarily, but I do like sweet potato fries! This recipe is a variation of the potato log. It was a recipe by Joyce Yates of Eupora in a magazine several years ago, and we have taken it up as a family favorite. Preheat oven to 400 degrees. Line the baking sheet with foil, spray foil or coat with cooking oil. Wash potatoes, pat dry and slice lengthwise into quarters or sticks. Mix oil and paprika, add potato sticks and turn to coat. Place on baking sheet and salt. Bake for 40 minutes. Makes four servings. Steam cubed sweet potatoes, tofu, and broccoli. Mix in raisins and serve hot or cold with a curried vinaigrette dressing. The oil in the vinaigrette will help you improve the bioavailability of the sweet potatoes’ beta-carotene. And then there is the special Sweet Potato Bake from my sweet friend Reba Thompson. This was one of several recipes she shared many, many years ago with The Delta Democrat and has been a staple at the Thompson house for years! Stir sugar and butter together over low heat until melted. Stir in eggs, vanilla and milk. Pour over potatoes in a 2 quart casserole dish. Mix together and pour on top of potato mixture. Bake at 350 degrees for 25 minutes. See this column in the October 21, 2016 edition of The Winona Times and The Conservative.